sales post + August Waza bulk order updates! Thanks for reading, and have a super week! Those involved with my Epcot Pick-Up: All that have recently paid have been shipped today or tomorrow! Expect some feedback from me tonight or tomorrow... or at the latest, this week! Those in the US will receive a PM from me sometime today with your tracking number [although it's actually delivery confirmation - I don't know the real difference, honestly... it came free for you guys!]. For the international participants involved, tracking was a lot extra, so it's not included with your shipping - darn it, USPS! Hopefully I got all the customs stuff right... They worry me the most, being a first-time shipper and the last thing I want is for you all to pay extra because I messed something up... Just let me know when they arrive to you and I'll be really relieved! Thanks so much! Those that have yet to pay - danielsard2 just theevilpotato! 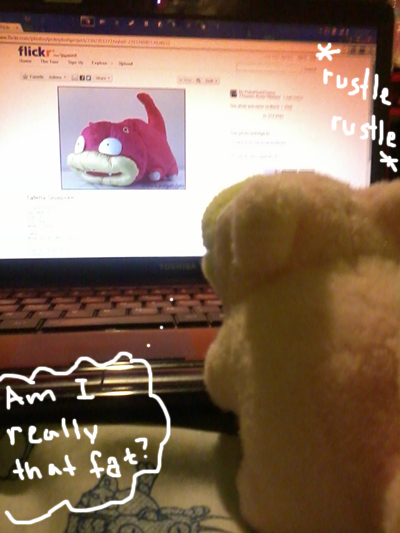 furaipan, and raikou_chan - the sooner you pay, the quicker I can get your plush to you! The payment post and spreadsheet are available HERE! Also, I've got an answer to your question, furaipan, so let me know what you're going to do after your get my comment! All paid and shipped out! Thanks so much! Secondly, I have a few little sales coming - at the earliest - next week! It'll mostly be some nice stickers I found, Action Flipz and custom-made charms [including requests, if wanted]. There may be some older TCG holos too, so look for it really soon! Thirdly, my summer gets post...! 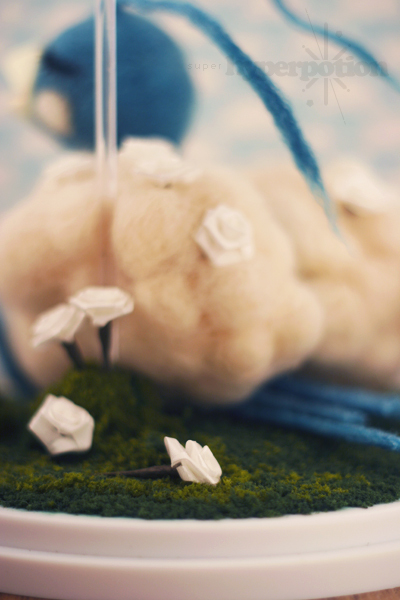 I'm aiming for sometime next week, as I'll have time to gather everything to show... because it's a bunch! Yeah, I betcha everyone knows these two, right? Thanks for looking at my shots and for reading! I hope you enjoyed it! Time Gear Sales' product listings are now available on this external website, but you can still order items from it just like you would any other LJ sales post using this journal entry. 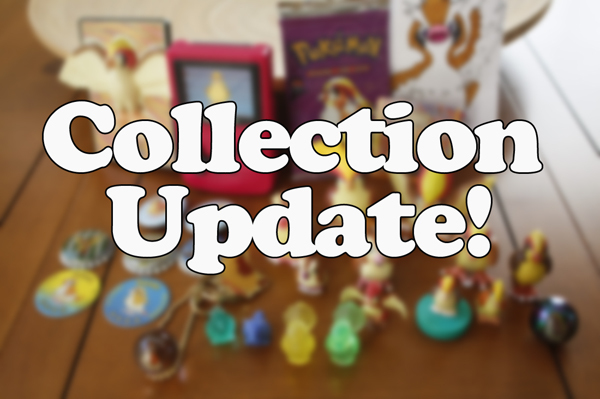 Feedback remains on Livejournal as well, or in the PKMNcollectors Feedback listings. So, why bother moving the actual listings to their own website when it's still basically an LJ sales shop? Well, a few reasons. -It's wayyyyyy easier for me to keep organized, so new products/prices can be added more quickly. AEON can badge totals are in! Please go check your total and pay ASAP :) Everyone got something! These auctions end in just a few hours. Go check them out! i have been looking for some good krookodile plushies and currently this one is my favourite. would anyone happen to have one for sale or know where i could get one? 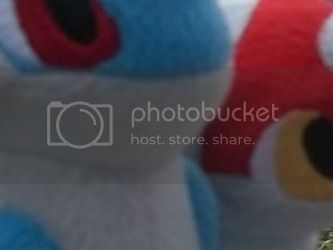 quick want post guys: upon reorganizing my room i have realized i have lost one of my furret items ;w; *i dont know how due to the fact that i didnt touch the side of the room where my furrets are anyways* but i cant find it anywhere and have come to the conclusion that i need a replacement :C does anyone have this furret marble i had previously purchased it from a comm member on here and so i am using the same photo. if you dont want me using it please let me know and ill take it down! Collection Update! Birds and Mice! Hello everyone! I haven't updated in a while! I've added a lot of stuff to my Pidgeot/Raichu collections and thought I would share! Be warned, there are a LOT of pictures under the cut! I tried to keep them pretty small though! I also have to add that my goal to collect one of all the first 151 Pokemon in Kid form is going well! Last time I updated I had 44/151 and now I have 86! 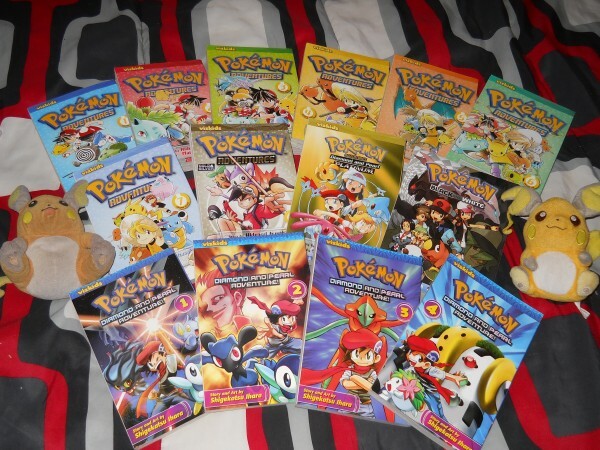 I have them all cataloged at my Pokemon collection website, which you can see here! Thanks very much for checking out my collection! Quick sales and a question! Hey everyone! 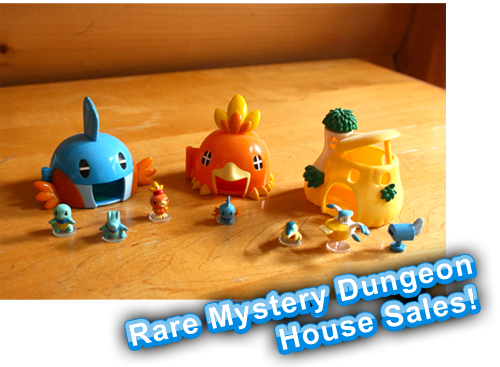 I'm here today with a few sales, which includes some old and rare Kanto items! 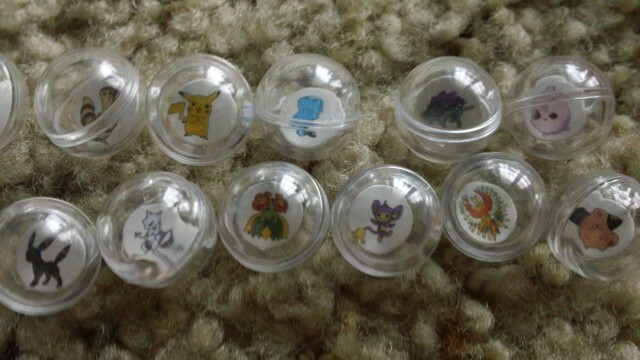 :D This means a Raichu roller stamp, Bulbasaur roller stamp, Brock TOMY, and a Squirtle playset! Everything is super cheap, as I need to make some major room up there! XD I'm going to be moving lots of things around upstairs for my collections, and also for painting a huge Poke-mural on one wall/ceiling. :3 So take a look! Sorry I haven't been around lately. D: I haven't really had much money to spend on Pokemon stuff lately. I have been creepin' around here like I did before I joined though. I think I've gotten enough stuff to have a little update now! 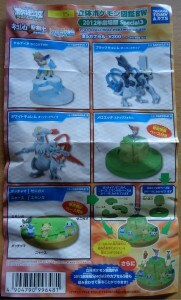 Including some Pokemon Conquest items. Feel free to haggle. I'm trying to get rid of things at my mom's house. I don't usually do gets posts, but I've got some pretty cool things recently, so I thought I'd share them! Time to click the cut! 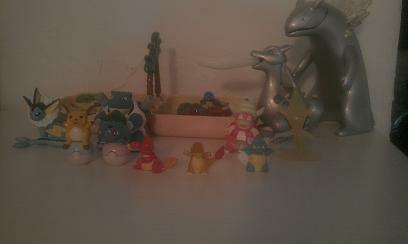 A quick reminder, I still need the Charizard, Ekans and Lickitung 151 figures to complete that collection! 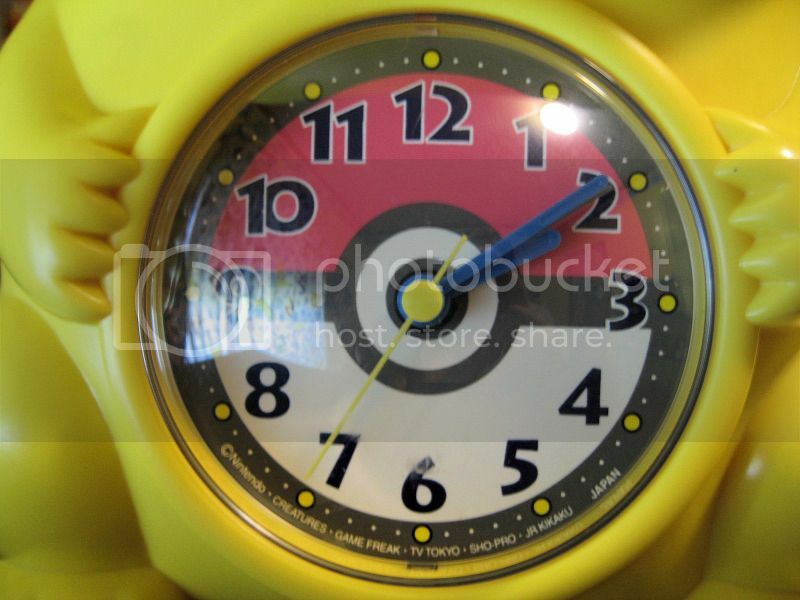 Also still looking for the Pikachu car plush, and any magazines that mention it. Also a quick question, can somebody plz help me identify this card? and if you have it, would you like to part/trade for something inside the sales post? 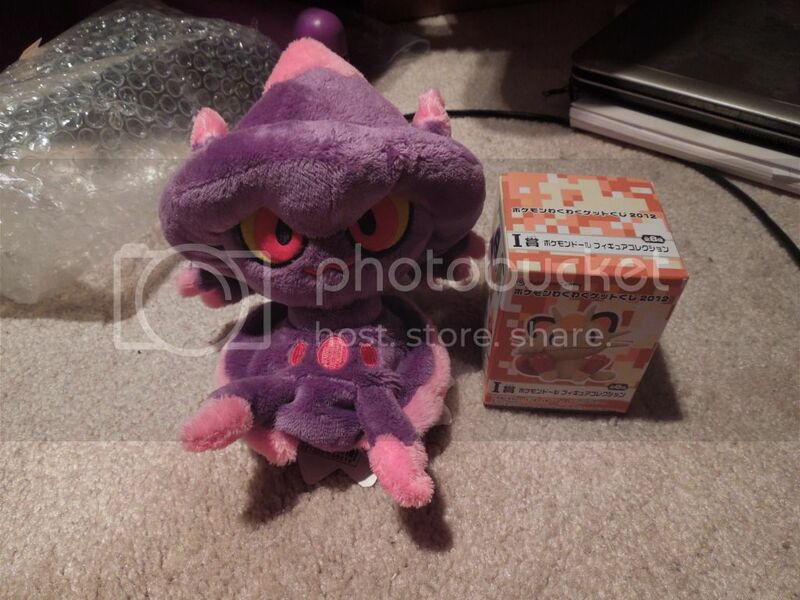 Zukantastic update + Lotto figure get! 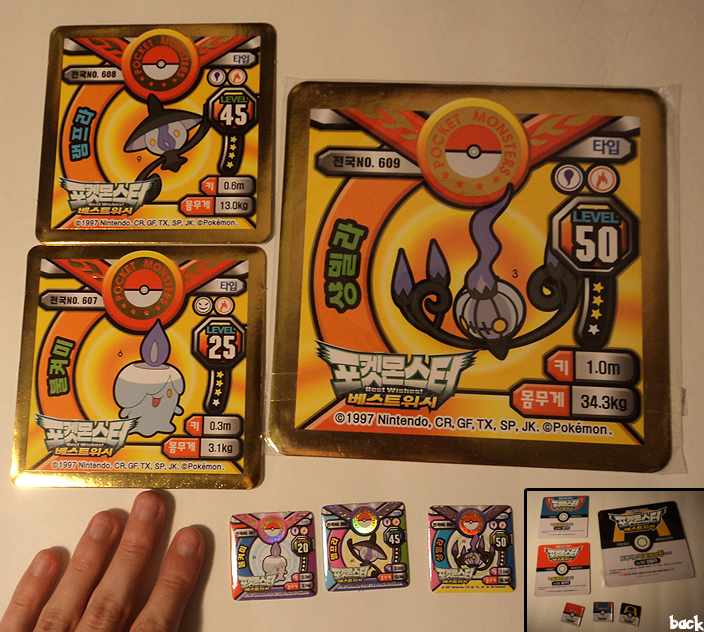 Next up, just a reminder for my sales including a Tropius Zukan Piece, Japanese Articuno Zukan. Offers for my Flygon Zukan piece will also end soon! 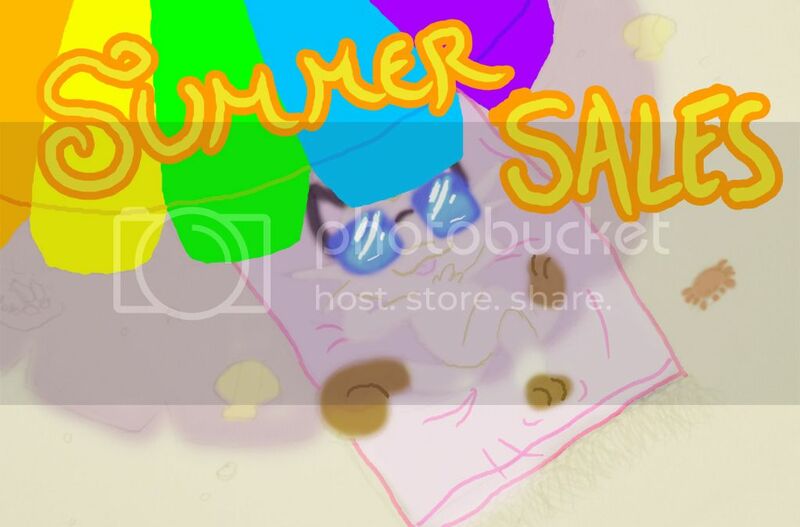 Finally just some wants ~ Name a price and I will pay it for these items! Thanks everyone ^^ Collection update soon! Things have finally settled down for a bit so I have time to take on a commission! I've missed making Pokemon! Really looking forward to working on this. Thanks so much for looking. A few days ago, I announced I will be doing a +Pokebox+ Group Buy for the long out of production Eevee and Umbreon charms this week! Now there has been a slight issue with Umbreon - the artist is speaking to the factory as the factory has made a colour mistake - but I will be able to start taking names for Eevee very shortly. I just need to talk to +Pokebox+ about final price. 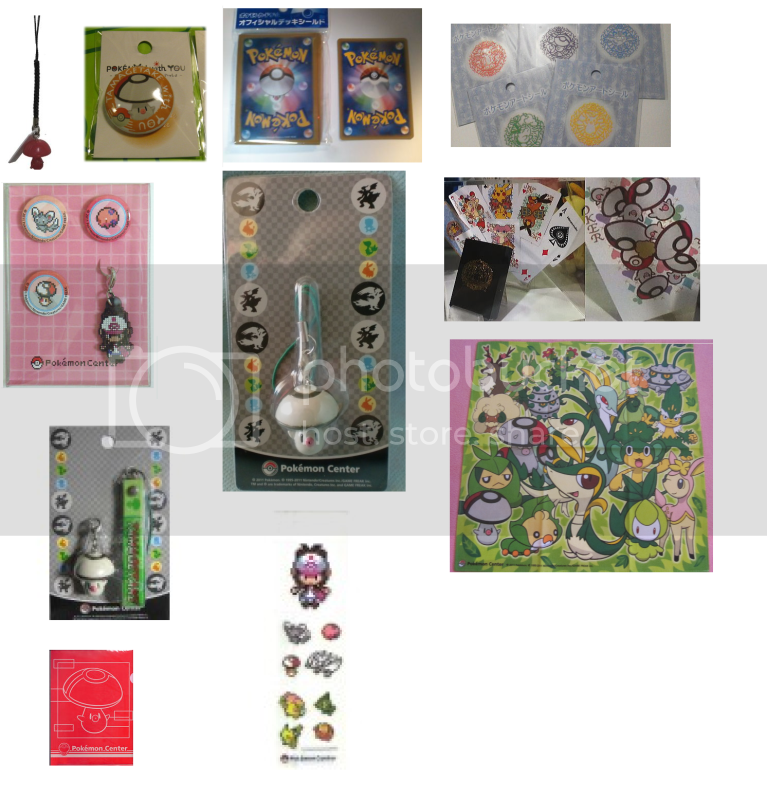 Today +Pokebox+ asked if we could group buy other items with the charms, so we will be discussing that! To tickle your tastebuds, here is Eevee! Mmm! I hope you're as excited as I am! 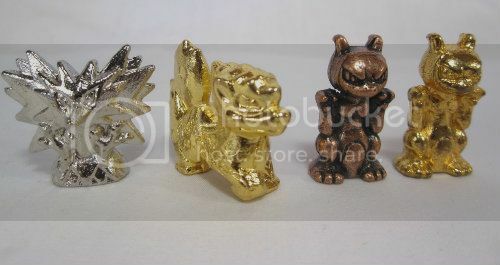 Charms should be affordable as other +Pokebox+ charms cost between $5 and $10 before shipping. 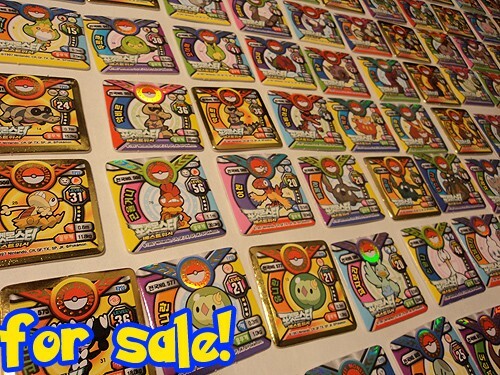 BW2 Gym Badge Collection by Movic! On the very heels of the Banpresto collection of gym badges won by Ash in the anime series, now Movic presents a new set of high quality badges of all BW2 gym leaders! They will be out September 13th and yes, we will have the reservation list for them started ASAP!! It will be unlimited so don't worry one bit! EDIT: Self fulfilling prophecy? Sneak peek of the order sheet for the new kids in October! No, I don't know if they are repeats, or just being lazy on this sheet. We'll have to wait and see! GIGANTIC Metal figures sales and auctions!!! Metal figures sale and Auctions here! EDIT: I'm off to bed but will reply to all of your comments in the morning! Needing to sell on alot of this stuff, Im now more likely to accept reasonable offers this time. I have sheep, foxes and hounds for sale here so, If you collect them! Take a lookie! I have a HUGE box coming in from Y!J soon and it will entail a MASSIVE (literally, HUUUUUUGE) collection update! :D Im so excited! Black and White stuff for sale, and an auction! Hi everyone! I've acquired some interesting b/w game pieces. I think they'd be a unique addition to everyone's collections, and I'm selling them off! All pieces are $1 each! Get your favorite before it's gone! For auction are these giant prize pieces, happening right now. Don't miss it! Well I just recently got back into the community and have yet to make a collection update. Although now that I think about it, I've done a total of one collection post ;-; There's nothing specific that I'd like to highlight but I moved in April and have just completed my set up! Also some of my recent gets inspired me to do this :3 Quick preview for ya'll! 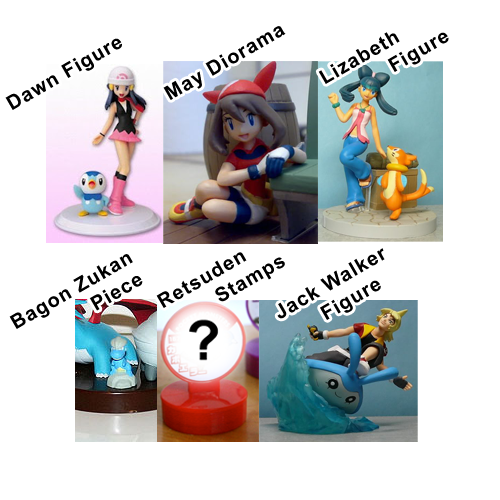 Anyhow, I'd like to put a few small wants here: Tynamo MPC, "Dragon" TFG (see my collection for explanation of quotes), Vaporeon Jakks Pacific figure, any Leafeon, Ditto or Kakuna merch not pictured in my collection! Ello guys. I haven't disappeared, just been very busy and getting ready to head back to school. I have a small wants post today as well as a little meme. Well, now that's out the way, I'd like to show you guys some of my new gets, plus some stuff I forgot I had! When I made my introduction post, we had just moved and there were boxes and bags and...it was a wreck. It's no wonder I couldn't find a lot of my stuff. But I've found it now and I'd love to show it to you all! Also, please check out my Wailord Pokedoll auction here! Finally after a bunch of near misses... A MISMAGIUS! :D It took forever to find and finally some popped up on SMJ last month! Ahhh! She's so cute!!! 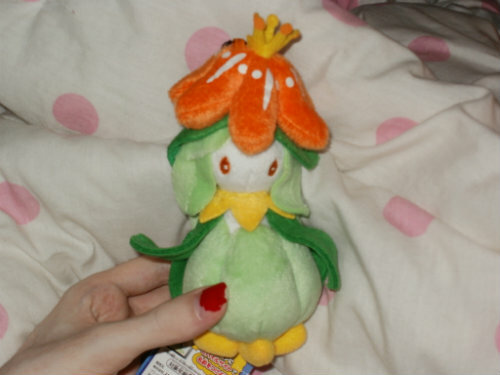 She was up there with swampert on pokedolls that I really wanted. 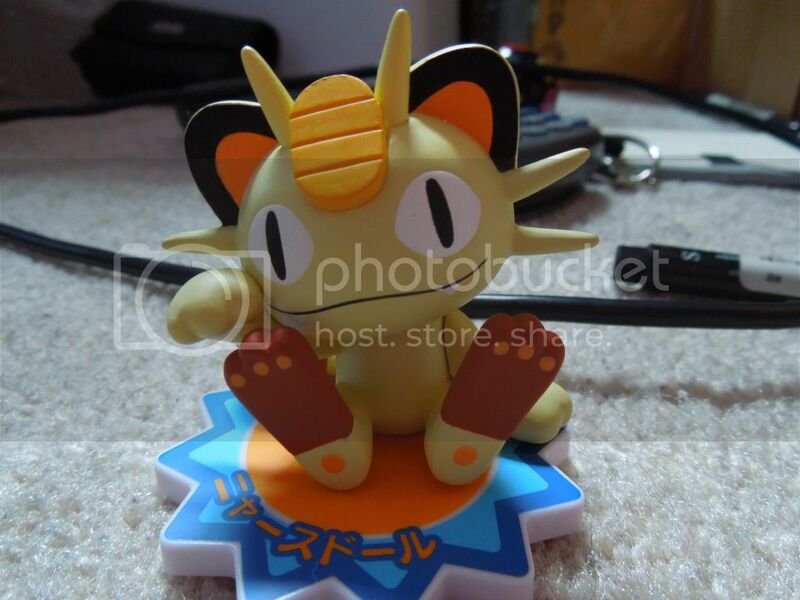 I also snagged a meowth pokedoll figure. A lot bigger and cuter than I thought, especially with the cute starburst tag base. I really hope they re-release meowth's pokedoll. 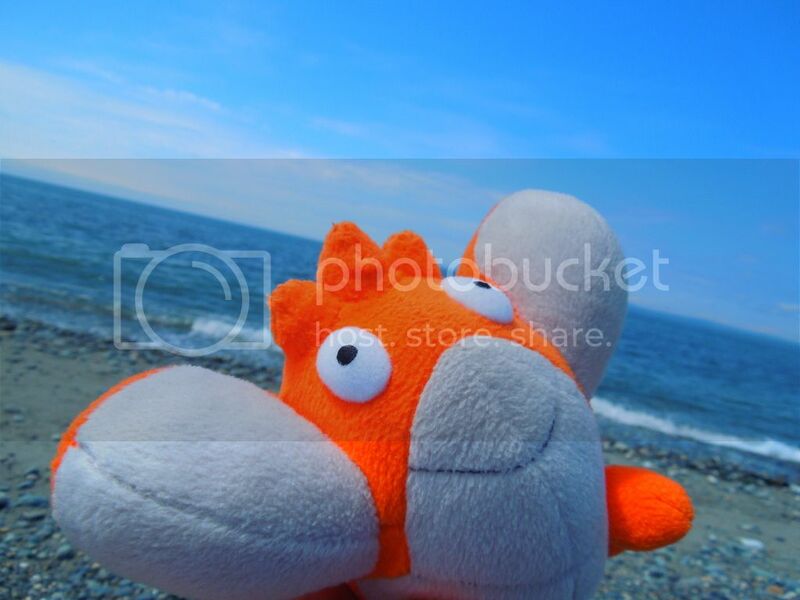 And now for a photo story; full of intrigue and adventure! Sales plug! I'm going to close in about a week to get ready to move back to school. Anyway, my favorite Pokemon is Vaporeon, as my username suggests. Some of my other faves include Glaceon, Espeon, Lilligant, Goldeen, and Jigglypuff. I'm so sad they never made a Goldeen plushie. At least to my knowledge they didn't. Not rare or anything, but super cute and soft! Well I look forward to getting to know you all! Hello again, I redid this post due to an error on my part having to do with sizing, but my name is abailie and I'm fairly new to this community. 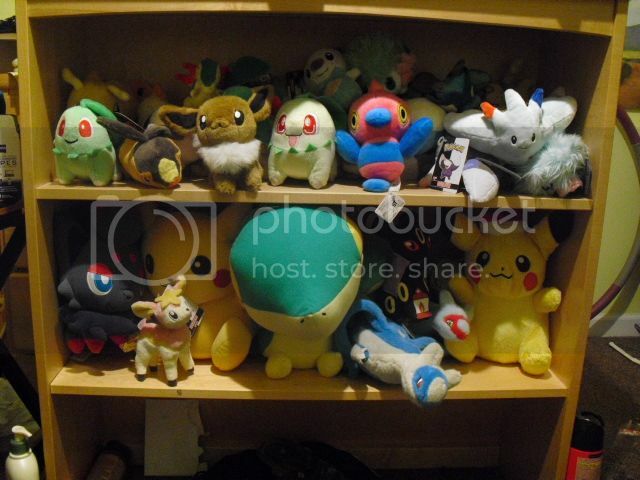 I was asked to put up collection photos in my first post so here we are, I collect mainly plush and manga, specifically Raichu for it is my first and favorite pokemon. The Banpresto Raichu plush is on the top of my Poke wish list and the hunt for it is what led me to this forum. As far as manga goes I'm really looking for english langue versions of the Pokemon Adventure (or special) for the Ruby/Saphire, FireRed/LeafGreen and Emerald volumes. (I've already read them before online so I'd be pretty thrilled about Japanese volumes too but honestly I do not understand why viz has not released them in America.) I'm also looking for an English langue volume/book/issue of the Red and Blue story Arch that doesn't have the recent Viz censorship of Green's (or Blue in Japan) Pokeball breast gag. I remember reading that when I was a kid and thinking it was the funniest thing ever. In general I like collecting Electric types for they are my favorite and I'd also be interested in any Pokemon house or kitchen ware, especially if it's electric themed. 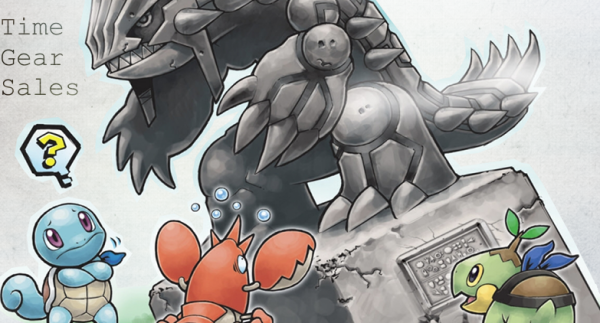 'the art of Pokemon Colosseum'? I'm very curious on this piece of merch! I got an awesome recent get and I want to share it with you.